ANKARA, Turkey Turkish jets on Wednesday forced a Syrian passenger plane to land at Ankara airport on suspicion that it may be carrying weapons, Turkey's foreign minister said, amid heightened tensions between Turkey and Syria that have sparked fears of a wider regional conflict. The Syrian Air jetliner was traveling from Moscow when it was intercepted by F16 jets as it entered Turkish airspace and was escorted to the capital's Esenboga Airport, the state-run TRT television reported. Hours later, the Airbus A320 with 37 passengers and crew were be allowed to leave, but its cargo had been confiscated, Foreign Minister Ahmet Davutoglu said. 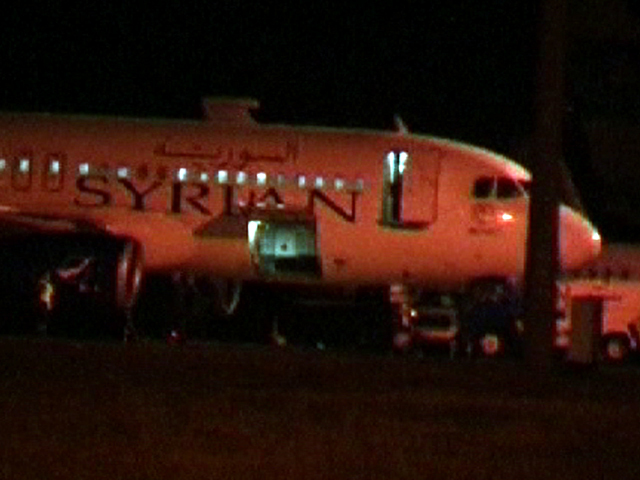 Reuters reports the passengers were allowed to continue to their destination. Davutoglu earlier told Turkey's TGRT television that the plane was intercepted on suspicion it was carrying illicit cargo to Damascus. "If equipment is being carried under the guise of civilian flights or if they are not being declared, then of course we'll inspect it," he said. Hurriyet newspaper's website, citing unidentified intelligence officials, said communications equipment, wireless sets and jammers were found on board. NTV television reported that authorities found "missile parts." U.S. Defense Secretary Leon Panetta said Wednesday that Washington has sent troops to the Jordan-Syria border to help build a headquarters in Jordan and bolster that country's military capabilities in the event that violence escalates along its border with Syria. In Syria's largest city, Aleppo, regime troops and rebel fighters exchanged fire for several hours in and around the historic 13th-century Umayyad Mosque, said local activist Mohammed Saeed. Aleppo has been the scene of intense fighting, particularly since rebels launched a new offensive two weeks ago to try to dislodge regime troops. The fighting has devastated large areas of the city of 3 million, Syria's former business capital. Holding onto Maaret al-Numan would be a significant achievement for the rebels, enabling them to cut the army's main supply route to Aleppo and Homs, both of which came under bombardment from the regime's helicopters and artillery on Wednesday, according to activists. The Anadolu news agency reported fighting between Syrian rebels and forces loyal to Syrian President Bashar Assad's regime around the town of Azmarin, in Idlib province, across from the Turkish border. It said Syrians were fleeing homes in the Azmarin region, some crossing into Turkey by boat over the Orontes River, which runs along the border. Also on Wednesday, state-run news agency SANA said Assad appointed Sattam Jadaan al-Dandah as Syria's new ambassador to Iraq. The report did not say when al-Dandah would travel to Baghdad. His predecessor, Nawaf Fares, defected in July, becoming the most senior diplomat to abandon Assad's regime during a bloody 18-month uprising that has morphed into a bloody civil war.